This information is found in the comprehensive book on the legends and history of the Catalina Mountains– "Treasures of the Santa Catalina Mountains." Read sample pages and download free PDF. The story of a lost mine with an iron door near Tucson, Arizona has persisted for hundreds of years. 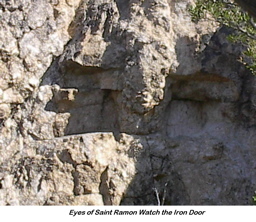 The legendary Iron Door Mine treasures may still be deep within the Santa Catalina mountains, north of Tucson, Arizona, according to Arizona prospector William T. "Flint" Carter and other historians. The Mine with the Iron Door has been one of the most extensively hunted lost mines in North America. Movies and books have glorified the legend. It's real riches have yet to be revealed. That legend, though, may have some truth buried with those treasures. The lost mine may still be somewhere in the Catarina Mountains, near the Cañada del Oro, "the Canyon of Gold." Some people over the centuries have claimed to discover its location. But, the exact spot of this treasure has never been documented. The Lost City and lost mission in the Santa Catalinas. The book and movie "The Mine with the Iron Door"
Watch several videos about the legendary Iron Door Mine and discover the history and legend of the Old West with historian Flint Carter. The Lost City in the Catalinas. Buffalo Bill: "Beyond the Legend"
William F. Cody, better known as Buffalo Bill, who owned mines near Tucson. Cody Stone is from Southern Arizona, USA and designed as jewelry grade gold and silver in quartz. Cody stone specimens and hand made items are on display at the Oracle Inn Steakhouse & Saloon in Oracle, Arizona. Call Flint at 520-289-4566 or email [email protected]. Mention the Iron Door web site. See more Southwestern Jewelry Grade Gold and Silver in Quartz by Flint Carter. 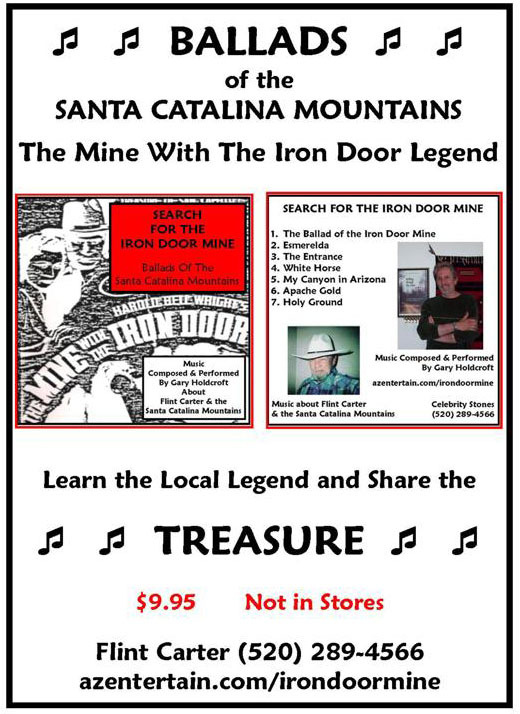 Listen to songs and ballads on CD about the Iron Door Mine, the Santa Catalina Mountains, the Old West by Arizona historian Flint Carter. $9.95. Call 520-289-4566 for more information and to purchase directly. Mention the Iron Door web site. Explore displays of over 1,000 Old West artifacts and specimens from the surrounding area with Flint Carter. Learn about Western legends. Call Fint at 520-289-4566. Mention the Iron Door web site. The Santa Catarinas, now called Santa Catalina Mountains north of Tucson, is part of the Coronado National Park. Within the mountain range is Pusch Ridge, the Samaniego Ridge, Oracle Ridge and Mt. Lemmon. The Cañada del Oro flows north out of the Catalina Mountains, near Oracle. It turns south through Saddlebrooke and empties into the Santa Cruz near Ina Road and Interstate 10. The Spanish name Cañada del Oro means canyon of gold in English. The Canyon of Gold was well known for its placer gold mining and sparked the American gold rush to the area in the 1800s. The river is now a dry creek bed except for a few times a year. At one time, it ran steadily out of the Catalinas. Parts of the riverbed are still favorite spots for amateur prospecting for gold flakes and grains. Several mining claims are still in effect in the mountains. The Arizona Mining Association history of mining in Arizona reports that mining has been ongoing for centuries in Arizona. "The region's wealth first became apparent in 1535 when Alvar Nuñez Cabeza de Vaca and his companions reported hearing tales of cities of gold in the region. Calling their finds the "Seven Cities of Cibola. "...in 1582 when Antonio de Espejo reported on the richness of the region and the discovery of mines in what is today central Arizona." "Spain returned to the region in 1686, when the Jesuit missionary Eusebio Francisco Kino was assigned to the area known as Primeria Alta (upper land of the Pima Indians), which is now Northern Sonora and Southern Arizona. Four years later Kino entered present-day Arizona and established the missions of Guevavi, Tumacacori, and San Xavier del Bac. Although Kino's emphasis was on missionary activity, there are reports of mining by the natives." "In addition to mining being done by the natives, the Spaniards also resumed mining. In his accounts of Pimeria Alta, Kino wrote, "many good mines of gold and silver . . . many rich veins now being established." While it is believed he was writing about Northern Sonora, he may have been referring to the area around Tubac, Arizona. This belief is based on the presence of many abandoned Spanish mines in the Tubac-Tumacacori area, which were re-discovered when the Americans arrived in 1848. " Cabeza de Vaca never found the City of Cibola reported to be near Tucson. Instead, villages of poor Indians lived in the area. Father Kino arrived in Sonora in 1687 to work with the Pima Indians to established the first Catholic church. According to the newspaper story in 1880 Arizona Weekly Star, it was known that in the 1700's, the Jesuits had "large fields under cultivation and many men employed delving in the earth after precious metals and turquoise stones." "At that time, the principle gold mines were situated in these mountains and there was a place called Nueva Mia Ciudad" (Nine Mile City), having a monster church with a number of golden bells that were used to summon the laborers from the fields and mines." The article describes the city on a plateau of a mountain that had a mine full of riches. When the Jesuits fled the Franciscan's occupancy of the Tucson valley, "they placed an iron door on the mine and secured it in such a manner that it would require a considerable time to unfasten it," the article said. There were only two entrances to the city that were closed. All traces of the city were obliterated. The article called "The Mine with the Iron Door and the Nine Mile City of the Santa Catarinas" was dated from the Martin and Welde's Camp, February 24, 1880 and published the Arizona Weekly Star (now, the "Arizona Daily Star") on March 4, 1880. The article continues with a story from several prospectors who described their exploration for the Nine Mile City and the mine with the iron door. In the story, they found the tunnel and recovered some gold. In "Lost Gold and Silver Mines of the Southwest" Eugene L. Corotto connects the Lost Escalante Mine with the Iron Door Mine, the subject of Harold Bell Wright's 1924 book "Mine with the Iron Door." The story is that the Papago Indians helped the Jesuits work the Escalante Mine in the Santa Catalina Mountains prior to their expulsion iin 1767. In 1768, Franciscan missionaries of the College of Queretaro were placed in charge of the Pimeria Alta missions, according to Tumacacori's Yesterdays. In 1751, the natives conducted the	Pima Indian Revolt against the harsh discipline of the Jesuit missionaries. In 1767, the Spanish government had expelled the Jesuits and the Franciscans to replaced them. An account by John D. Mitchell ("Desert" July 1952) says "the treasure vault was near the south bank of the Cañada del Oro...the ruins of an old camp and the foundations of the little chapel where the priests said mass may still be seen." On San Juan Day in June 1796, the Apaches raided the mine camp and killed the Papagos. The settlement was destroyed and forgotten. One clue Mitchell gives to its existance is a ventaña- a large natural hold in the rock that resembles a window. Ventaña is Spanish for window. The mine is "one league northwest of the veñtana," he wrote. One league is equal to about 3 miles. A league could be covered in about an hour walk. Some say the settlement may have been located near the present site of the Romero Ruins. Others speculate it is deep within the mountain valley. It may have also been called the Mission of Ciru in the Valley Viejo ("old valley"). It was also called Rancho Viejo. The Oracle, Arizona area is well known as a mining town dating from 1880. In 1887, Jimmy Lee and Albert Weldon from Ireland joined with Alex McKay of Scotland to prospect the mountains for gold and silver. Weldon, who had discovered the first mining claim, named the town, Oracle, after the ship he was on that arrived in the Western United States from around South America. One of the most famous pieces of Western history in the area is the High Jinks mine, started by William “Buffalo Bill” Cody and his partner in 1912in search of a rich deposits in Camp Bonito. At one time, 200 miners were employed to mine the backside of the Catalina Mountains. Cody opened the High Jinks mine near Oracle in 1912. In 1917, Harold Bell Wright came to Tucson and lived in a cabin at the Coronado Camp, just over the Samaniego Ridge to the east of Saddlebrooke in the middle of the Santa Catalina Mountains. This is the spot where Wright composed the book “The Mine with the Iron Door." The novel, published in 1924, was made into one of Arizona’s first Western movies of the same name. It was filmed at the local Linda Vista Guest Ranch in 1924. The subject was redone three more times for a total of four full-length motion pictures. It was the only movie with multiple spin-offs on a single topic until the Star Wars series. A park on Tucson's eastside honors Wright and several streets nearby are named after his characters from the book. In 1936, the film was re-shot in Hollywood under the same name. It was remade in 1955 and titled “The Secret of Treasure Mountain.” In 1968, it was released under the title “McKenna’s Gold.” This version was filmed in Canyon de Chey. Read more about the book and movie "The Mine with the Iron Door." Both the Cañada River and the Santa Cruz River have been studied extensively. Ancient canals for farming and habitation have been found throughout the Tucson valley. When the Motorola Executive Institute gave that area to the University of Arizona for the BioSphere, an archeological survey dated carvings, between 4-6,000 years old, overlooked miles of pre-historic irrigation canals for farming. Romero ruins built on the city of Ciru? There is an area near the Sutherland Wash in the Catalina State Park with a known Hohokam Indian settlement that was later abandoned. The Hohokam inhiabited the entire Tucson valley until about 1400 when they disappeared from the area. Some undocumented reports claim that the Mission of Ciru occupied this spot in the Valey Viejo. That area was later settled in 1844 by Francisco Romero, who apparently built his homestead on the ancient Indian ruins. That angered the nearby Apaches who attacked his adobe frequently. The Tucson Citizen published an article in April 2008 about the Romero Ruins and the Hohokam people. "The most successful enterprise in the general area of the Park was ranching. The earliest known rancher within the Canada del Oro region was Francisco Romero who was born in Tucson between 1810 and 1831, the grandson of a Spanish soldier who had arrived in Tucson in the 1770s. Although little is known of his childhood, he is mentioned as establishing a ranch of 160 acres on the west side of the Catalina Mountains in 1844 near the Canada del Oro. Romero evidentially was a successful rancher, since he acquired additional pieces of property including 320 acres of farmland along the Santa Cruz River west of Flowing Wells and land on Main Street in the downtown Tucson business district. "Francisco and his wife, Victoria, had three children, one of whom became a rancher. His name was Fabian, born in 1864, and he is credited as the founder of Rancho Romero. His ranch is reported to have been 4800 acres. According to a map of Pima County drawn up in 1873, the Romero Ranch buildings were shown as located in section 4 that is within the Park boundary. A capped well and a concrete base for a water storage tank are the only remains that were found at that location." A 1/3 of a mile long trail in the Park that passes the ruins is called the Romero Ruin Interpretive Trail. See more about hiking in Catalina State Park. The mystery of the Mine with the Iron endures. 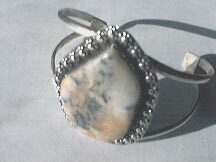 Cody Stone: Jewelry Grade Gold and Silver in Quartz made into exquisite jewelry and art. Video #2: Tour Cañada del Oro- the Canyon of Gold and Iron Door Mine legend with Flint Carter. Video #3: Flint Carter describing his findings, the San Xavier Mission and other Arizona history. Video #4: Experience the Iron Door Mine Legend with Flint Carter. Video #5: Buffalo Bill "Beyond the Legend" DVD. Learn about William F. Cody, better known as Buffalo Bill, an entertainer who performed for hundreds of thousand of people from around the world at the turn of the 19th to 20th Centuries. "Young Buffalo Bill" starring Roy Rogers (1940). Buffalo Dance (1894) "According to Edison film historian C. Musser, this film and others shot on the same day featured Native American Indian dancers from Buffalo Bill's Wild West show. William Thomas Carter, "Flint" to his friends, is an artist and author born in 1947 in Danville, Illinois. After attending Danville High School, he served in Panama during the Vietnam conflict at the Latin American Headquarters Post. He received the National Defense and Good Conduct medals. Returning home, Flint attended Danville Junior College and later Southern Illinois University. Special interest in the design department, headed by Buckminster Fuller, inspired the building of Arizona's first solar heated and cooled museum. For more information contact Flint at 520-289-4566 or email [email protected]. Mention the Iron Door web site. 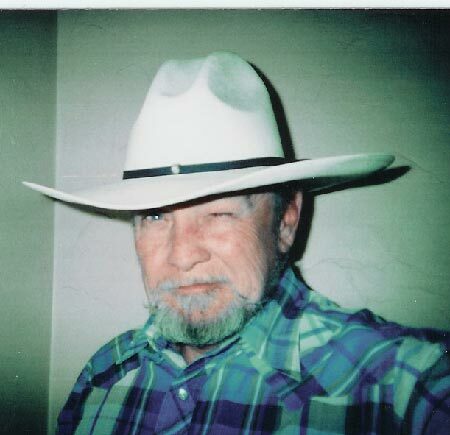 Read more about Flint Carter, Celebrity Stones, art and jewelry and the Iron Door Mine. © 2005-2010 EMOL.org. Entertainment Magazine. All rights reserved.